Recently, I posted the below on Twitter, referencing this particular article about Twitter bots. Now, not all bots are bad, many were created for very good, or at least harmless reasons, for example, I follow a bot that tweets a graph of local river levels every few hours, and another that generates fictional museum exhibition names. However, if when such a high number of accounts are bots, it starts to make the entire site useless. 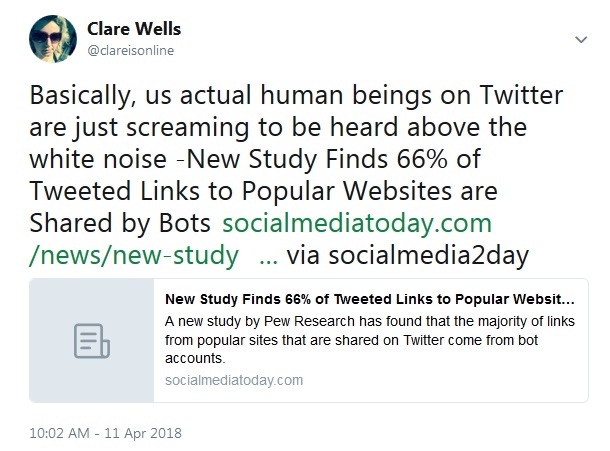 As the original article states, it makes Twitter engagement analytics pointless- how can you prove a real human being liked or retweeted your tweets? How can you prove growth? There are research issues to consider to – at University I did quite a bit of work on mapping Twitter connections – this was in the earlier days of academic research on social media and Twitter was quite a different beast then. Connection-mapping techniques would produce seriously flawed data in today’s Twittersphere, when mindless machine accounts are linking ‘real’ accounts up. Either Twitter, or research techniques, will have to change at a fundamental level.